Marouane Chamakh breathed new life into Crystal Palace's survival bid and dragged West Ham back into the Barclays Premier League relegation battle. The much-maligned Moroccan striker's goal secured a 1-0 victory in Tony Pulis' first home match in charge of the Eagles and lifted them off the foot of the table. But his 42nd-minute header earned Palace only their third win of the season, and their first since Pulis officially took over from Ian Holloway. West Ham went into the match knowing victory could have catapulted them into the top half, but instead they are now just three points ahead of a Palace side who looked doomed a few weeks ago. Sam Allardyce's team, fresh from a 3-0 thumping of Fulham on Saturday, are still yet to string together back-to-back Premier League victories since they were promoted last year, a statistic that could yet cost them dearly this term. Palace received a boost 24 hours earlier when captain Mile Jedinak signed a new long-term contract, and the midfielder showed throughout why he is central to their chances of beating the drop. Tough in the tackle and uncomplicated on the ball, the Australia international also has a trick or two up his sleeve and one fine piece of skill saw him spin away from Kevin Nolan and Mark Noble before finding Jason Puncheon. Unfortunately for Palace, Puncheon's shot did not match the build-up and was comfortably dealt with by Hammers goalkeeper Jussi Jaaskelainen. Yet from then on it was West Ham who looked the team likelier to break the deadlock in the first half. England Under-21 starlet Ravel Morrison tried his best to unsettle the Palace defence on the rare occasions he escaped Jedinak's clutches and one powerful run drew a foul from Damien Delaney, who was shown a yellow card. Noble chipped the resulting free-kick over the Palace wall, a move straight off the training ground, but Nolan scuffed his volley on the turn straight at Julian Speroni. West Ham's best chance fell to Mo Diame, who should have done better when he met a curling cross from Stewart Downing only to head over the top. 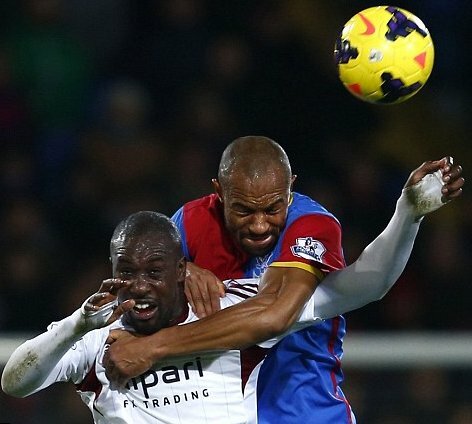 That miss looked even more costly moments later when Palace took the lead. Barry Bannan's initial corner was blocked but, when the ball came back out to him, the Scotland midfielder whipped in a second cross which was glanced home by the now unmarked Chamakh. Pulis could clearly sniff blood because Palace came out for the second half looking to kill West Ham off. The visitors were caught out by Jedinak's lofted pass which sent Cameron Jerome through, and he fed Chamakh who in turn found Puncheon, whose shot was saved a full stretch by Jaaskelainen. Another Bannan cross was headed narrowly over by Kagisho Dikgacoi and Jaaskelainen spread himself well to deny Jerome after he raced through one-on-one. West Ham did have the ball in the net after 65 minutes when Downing lashed in a low volley, but James Tomkins had already been penalised for a foul in the area. The same fate befell Palace sub Jimmy Kebe moments later when he tucked in Jedinak's cut-back, the midfielder having been flagged offside. West Ham pressed for an equaliser late on but Morrison and James Collins were off target, while Kebe hooked a stoppage-time chance over for Palace. Morrison's frustration boiled over at the final whistle as he earned a booking for shoving Joel Ward in the face, while Pulis and Palace celebrated what could be the start of something special.